Update (Posted June 26): It’s Doors Open for the Summer Luncheon, come and enjoy the story of this great Milwaukee event! Here’s the detail info: Summer Luncheon. This has been a very busy Spring at WSJSociety.com. As mentioned in the last From the Editor and in the Newsletter, in March we introduced several major changes to the website. The goal is to provide a more interesting and valuable experience to you, our members. See What’s New@WSJSociety.com/May 2016 as published in the Newsletter. Scrolling down the Front Page, to the Business Section you’ll find more stories on both the merger and the spin-off of Adient. There will be lots of activity this summer on both of these initiatives. We’ll try to keep updated information available to you. It needs a bit of re-organizing at this point, but watch for updates. And I am always interested in your suggestions for improvement. 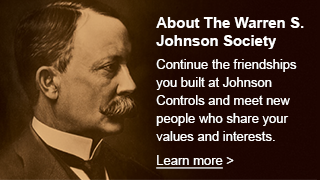 Of course the Johnson Controls/ Investor website is the primary source for this information. We recommend that you visit it as this all moves forward. Out & About … with our members is a new feature for the Newsletter and online. You can check out the first posting at: Out & About … May, 2016. If you think this is fun .. you’re right! This kind of volunteer work allows me to stay connected with some great people, play with technology, and share some thoughts with all of you. And you are invited to join! We have JOB Opportunities just made for you. Check out the current list available at The Hub/Connect/JOB Opportunities. Check back often, the list will be updated as we go along this journey. If you have another idea for a contribution to our community, please let us know. You can Join the Discussion with your Message to the Editor.